Click the image to download the 2Mb English version. This booklet has captured attention around the world. Donors have paid for over 160,000 copies so far in the US, Australia, New Zealand, Sweden and soon in Germany. Over 60,000 copies have been downloaded from this site (and countless others from copies on other sites.) Plus volunteers have translated it into German, French, Norwegian, Finnish, Swedish, Turkish, Portuguese, Danish, Japanese, Balkan, Spanish, Thai, Czech, Lao and Italian. The second Skeptics Handbook is available in French and Turkish. (Versions in Dutch, and possibly Italian are on the way). Updates are placed here, along with translations, as well as places to read comments and links to the web-pages where each part of the handbook will be discussed. I confess this page is not always up to date. For the latest list of all translations : See all posts tagged Translations. … The second Skeptics Handbook “Global Bullies Want Your Money” is out! …For information see it’s announcement. Click on the image to download the 2.5 Mb copy. Ask if you want a large copy for better quality printing. Kids Against Anthropogenic Global Warming || Make Your Voice Heard! Man made global warming is a scam. - Mind If I Do A J? The big picture: 65 million years of temperature swings « Global Warming? Stupid question: If the concentration of CO2 is increasing, that would mean that either the density of the atmosphere is increasing, which seems absurd, or that CO2 is displacing other gases from the atmosphere. If that’s the case, then the greenhouse effect will only increase to the degree to which CO2 is displacing gases that are less greenhouse-y. Is this what climatologists are claiming? Sorry if this is basic knowledge, but I didn’t see this argument in the handbook, and I can’t recall anybody else mentioning it, either pro or con. It seems to me that if this is the claim, it would be difficult to measure which gases were being displaced by CO2, and to what degree. Are there any such measurements? If not, then it would seem there is no actual causal link between CO2 concentration and temperature, regardless of the degree of correlation. 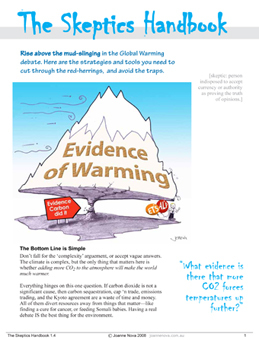 Without that link, the same thinking that accepts the warming hypothesis would accept any random hypothesis that CO2 and temperature increase together in response to some other factors. Und so weiter. Doesn’t seem very logical to me. Again, sorry if I’m being a dunce; I’m probably missing something, but one wonders about things. Is ‘Screaming Lord Monkton’ touring Australia again soon? He was great last time! We really need someone like him to point out the sheer greed of those blood sucking scientists who are making an absolute fortune by the wicked spreading of their assertions based on empirical evidence! I regularly see those bastards cruising by in their Bentley convertibles. Enough, and no more, fellow skeptics! A grain of skeptic sand is worth a tonne of scientific gold! Together we can defeat the insurmountable evidence!! Don’t expect the acadaemic scientists, suckling on the public teat, to be well rewarded. They’re the useful idiots. Give them just enough to remind them, what they have to lose should they stop. Hands up all those who think there is no longer a problem and we should all find new jobs, anyone? Global bullies!?? Can one of you nut cases please explain who these bullies really are? By that, I mean in reality, not the crazed dreams or visions you may have been experiencing. Joe V, you seem to be on top of this whole conspiracy thing. Perhaps you can shed some light? Disappointing to say the least. I was hoping this might be a guide to skepticism, it turns out to be a science denial pamphlet. Still if you love conspiracy theories and unsubstantiated assertions then this could be for you. I just love the notion that data is being hidden when it is readily available to anyone who cares to search. Just as an experiment I just found and downloaded the hadcrut4 dataset in under 5 seconds, and any paper on a specific issue will be published either including or linking the data upon which it is based. 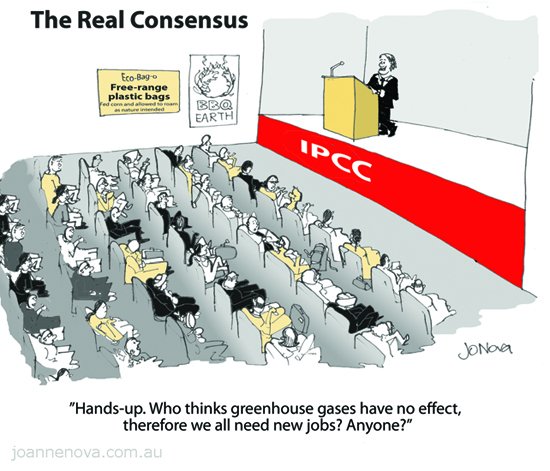 Any genuine skeptic will look forward to the real skeptics among you quickly accepting the scientific consensus. Good to have Chinese translation as well.